MIS Sales Analysis — Accu-Tech, Inc. The Sales Analysis module provides the business owner and managers with valuable customer, salesperson, and company performance statistics. The statistics will allow you to spot trends and preferences that will help you better manage your business, customers and sales force. The system will display and print dollar sales, costs, dollar profits, percentage profits, average order dollar amount, average dollar profit and percentage per order, top dollar customer, top profit customer, top dollar salesperson and top profit salesperson. These statistics will compare current month to the previous month, same period previous year and rolling year. 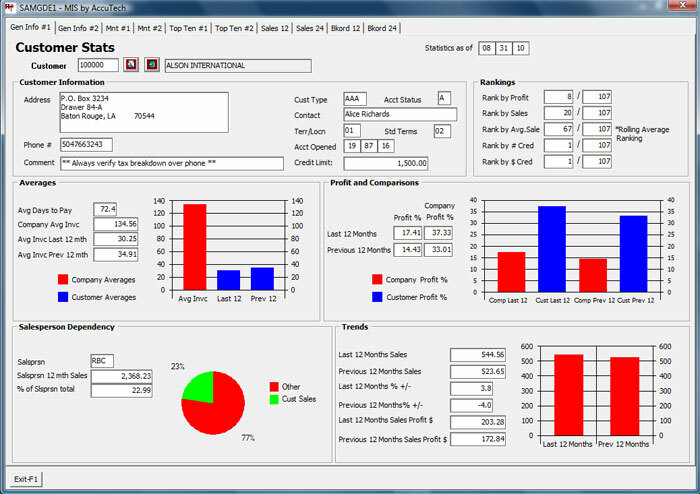 Your top ten customers and salespersons (by profit and dollar volume) are also tracked and displayed. The system will display and print demographic information on each customer, along with the customer’s top ten items purchased by cost, dollar volume, units and profits. Stock sufficiency (backorders vs. in-stock sales) is also provided, allowing you to determine if you are meeting the demands of your customers when they place an order. The system will display and print monthly figures on dollar sales volume, profits and trends. Figures are compared to goals which can be used in managing your sales force. The salesperson’s top 10 customers and their contribution to sales volume are also presented.